We produce mostly heritage varieties of apple, pear & other fruit trees on dwarf to full-size rootstocks, from Steepholding on the Somerset and Devon border near Wellington. Pre-innoculated with mycorrhizal fungi. 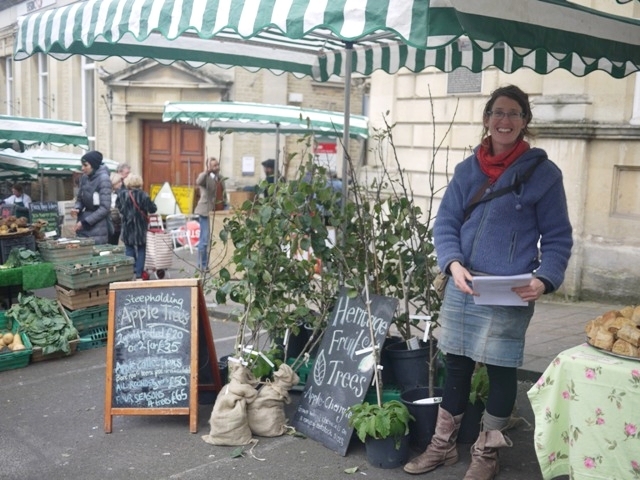 Our trees are available by mail order, gift vouchers and at farmers markets around the South-West including Frome, Glastonbury, Crediton, Axbridge and Wiveliscombe. We will be selling our fruit trees at many farmer's markets around the South-West this autumn, winter & early spring. See below for dates, and also see our events page for opportunties to visit us or meet us at other local events. Come along and meet us, get fruit growing advice & take home a root-wrapped or potted fruit tree, pre-innoculated with mychorrizzal fungi, or pick up a gift voucher as a gift. Sorry season over early - too much sunshine!